I checked the METAR when I got up this morning, and for the first time ever I saw CAVOK which was nice to see – the wind looked like it could be an issue, but it would depend on what it was doing by the time the lesson started. I go to the aero club, and was briefed by my instructor (Anthony). 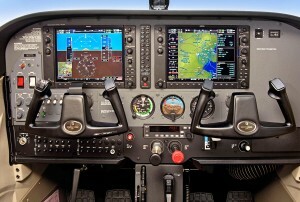 He told me that as all the others were either in use or in maintenance we’d be using G-MEGS – this aircraft has a Garmin G1000 glass cockpit as opposed to traditional instruments, and I was hoping I’d get a chance to go up in it sooner or later to see what it was like. The briefing explained what we were going to be trying to do (maintain a constant heading and altitude). Something that was pointed out that had never really occurred to me before is that there is no external (i.e. looking out the window) reference to determine what altitude you’re at or what rate you’re climbing/descending. We also went through lookout (a very important part of flying), with a suggested scan pattern for how to look around properly. Next was the cycle of things to do while flying, which is Lookout (look around for other aircraft etc), Attitude (check the attitude is what is expected), Instruments (cross check the instruments to make sure we’re heading in the right direction and at the right altitude etc). Finally we covered FREDA(L) checks – these are checks that should be done at certain points such as the top of the initial climb, and at regular intervals while flying. They are Fuel (check we have the expected amount remaining etc), Radios (check radios are on the right frequency and transponder has the right code set), Engine (check temperatures and pressures and that the mixture is set right), Direction (check compass and DI are aligned and that we’re going where we expect to), Altimeter (check it is set to the correct pressure setting), and Lights (this is only done at the top of the climb and on approach to the airfield – basically it is turning the landing light on and off). Then it was time to go out to the aircraft – I was given a new checklist for the G1000 – nothing different outside, though obviously a few changes inside. The instructor left me to do the majority of the checks myself while he went through the paperwork indoors, which is nice to know I’m trusted to do them right (he did peer in to the fuel tanks when he came out, but that was about it). I noted a small fuel imbalance (i.e. there was more in one wing than the other), which wasn’t a problem but just something to be aware of. Taxying is definitely getting more familiar now, I just need to avoid accidentally steering one way or the other when I brake (getting over instincts from driving a car really is quite difficult – I keep either trying to push the clutch or brake pedals when obviously they don’t exist)! Once we got to the hold the power checks were fine, we got takeoff clearance right away (things were quiet it seemed), I taxyed us on to the runway for the first time, and my instructor took us up. We did the FREDAL checks at the top of the climb, and we then went off to the area we’d be flying around in. Anthony demonstrated the correct attitude, and showed me what it’s like when its out of balance, then it was over to me to try and maintain it. I noticed that I was subconciously trying to judge altitude / vertical speed with reference to the clouds, which given they vary and are moving is really not a good idea! I also found that getting the right level of correction was tricky – overcorrecting means that the next time through the scan its obviously gone the wrong way. I also found if I corrected for example direction, the next time through my altitude would be off – trying to do lots of things at once is quite tricky (demonstrated even more when I was asked to lean the mixture, and once done realised I’d started climbing a fair amount!). The wind was a bit gusty, though on reflection this was probably a good thing as if it was calm then as long as I trimmed correctly it would basically fly itself, which would probaly have given me a false sense of security. I did the FREDA checks a couple of times during the flight, which were fine – at one point Anthony asked me where Cambridge was – without cheating and looking at the nice big moving map I had no idea – definitely going to have to work on that! I turned us back towards the airfield, made the radio call to say we had the field in sight (totally forgetting to say we had information Charlie in the process) and was told to change over to the tower frequency. I made the call to tower asking for a crosswind join, the reply was fairly long though and I wasn’t quite sure how to respond, so the instructor did it. He pointed out that they’d only asked us to report on final, which was unusual (normally it would be earlier) and suggested that the controller wasn’t expecting any other traffic for a while. I made the turn on to the downwind leg, and then the instructor took over for the landing. There was a bit of a crosswind coming down to land, and it was a little gusty so as last time it was done a little fast – we did have a little bounce on landing, but it wasn’t too bad. Once off the runway I did the post landing checks, and taxyed us back to park. It was quite tricky to see where to position to park (there are points in the ground to attach the tie downs to which prevent the aircraft from being rocked by the wind), but I got it pretty well lined up in the end which was good. Next week assuming the weather cooperates it will be Straight and Level 2, which is the same thing but with different airspeeds, so yet another thing to deal with – should be fun!